I thought about calling this entry, "For unto you is born a King..." but I didn't want all of the religious nuts Googling in here and accusing me of blasphemy (which I am very often guilty of). 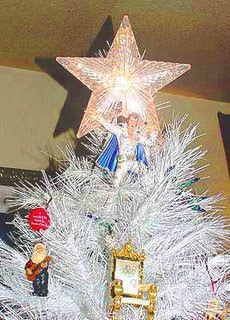 Although I am really not as obsessed with Elvis as one might think, I have woven the King into our Christmas tradition with the annual decorating of the Elvis Tree. The Elvis Tree was born out of my imagination a few years ago when faced with the dilemma of yet another Christmas and not wanting to kill a tree. It came to me in a vision. 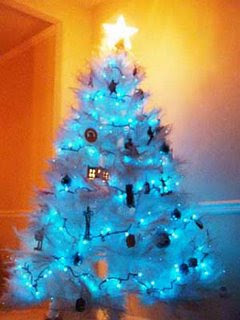 I pictured a white, artificial tree with blue lights and nothing but Elvis and Elvis-related ornaments. Now that we are in our new house, I wasn't sure Tess would be open to the Elvis tree. But fortunately we have a big house and room for two trees. Hey, look at that cat over there. That cat is huge. Ha ha ha. That's a good one Tiny E.
I'm just saying it's huge, that's all. Luckily, my wife hasn't had to tolerate any shrines. In reality, both cats are pretty darned huge. In this case they are paying homage to the Hillbilly Cat. truth be told, I was always a Beatle fan first. 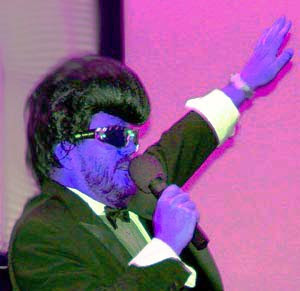 Please Tim, tell me you've seen the SNL Tiny Elvis skits. Otherwise, what I did doesn't make a bit of sense. But the cats really are huge. Tim I love the Elvis tree. It is gorgeous with the lights out. 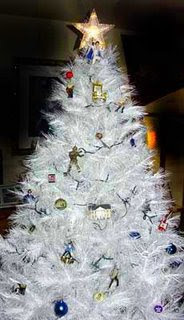 I think its wonderful that you decorate your tree with your true passions. I'm gonna have a hillbilly redneck christmas myself, equipped with beer can ornaments and toilet seat wreaths. 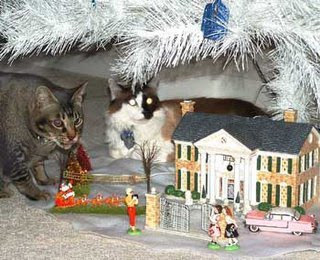 Thanks for appreciating the Elvis tree, shandi. I'd protest that it isn't my true passion, but I'd be accused of protesting too much. I like the redneck x-mas tree concept, but I think Walmart beat you to it. Well at least we know she doesn't love me for my good taste!